Editor Scott Mingus discusses his attendance at the annual Gettysburg Anniversary Reenactment, noting that author John Michael Priest “demonstrated a new 54mm skirmish wargame at Greystone’s American History Store.” Mingus also announced that his book Undying Courage: Antietam in Miniature had been published. Scott had several experts on Antietam and the Maryland Campaign review his work, including Curt Johnson, Tim Reese, J.D. Petruzzi, Eric Wittenberg, and National Park Service Ranger Brian Baracz of Antietam National Military Park. 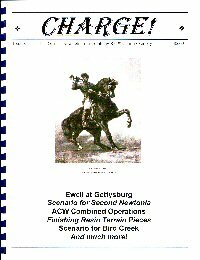 The second section is a Johnny Reb 3 scenario depicting Ewell’s attack on the Union XI Corps and parts of the I Corps on the afternoon of July 1. The Confederate goal is to take the town of Gettysburg to cut off the retreat of the Union I Corps. The article discusses an easy, effective way to model some of the brickyards that were present on the Gettysburg Battlefield (Kuhn’s Brickyard on July 1 or the brickyard near Cemetery Hill on July 2) for the 15mm scale of johnny Reb 3. The main material needed is a small Styrofoam ball cut into two pieces. These make up the body of the brick kilns. Balsa wood cut into sections serves as chimneys. Combined land and naval operations are discussed in this article by Doug Rogers. He uses Johnny Reb 3 for the land rules and Steam, Iron and Tin™ to replicate naval action. The SIT rules are unfortunately no longer available. Scroll to the “RULES THAT WE HAVE WRITTEN OR MODIFIED FOR OUR USE” area on this site for details. Veteran naval gamer John McBride discusses the Civil War naval game UNDER BOTH FLAGS, designed and sold by Bay Area Yards. McBride cautions that the game will take a bit of effort to get set up, as it is not an “play out of the box” type of game. Ship logs for 145 ships must be printed out (and possibly laminated if one desires). McBride believes the ramming results in the game may be a little too favorable to the rams, but he believes that the ship logs “alone are are worth the price of the rules.” The author also seemed to be encouraged by the way the rules handled fleet actions, and gave an overall positive review. John Hill answers a question about Command Levels between JR2 and JR3. In JR2, regiments typically had 5 stands, so calculating 40% and 60% losses was easy (2 and 3 stands lost, respectively). In JR3, 4 stands per regiment is the norm. This makes it impossible to calculate 40% and 60% by removing stands. The game designer discusses alternate methods to calculate losses in regiments, while still counting by stands when dealing with higher level organizations. In late 1861, Cooper’s Confederate force was sent to drive Opothleyahola’s band of Creeks and Seminoles out of the Indian Territory. Opothleyahola had been promised support by his “friend” Abraham Lincoln. Cooper’s force met up with Opothleyahola at Chusto-Talasah (Caving Banks), driving the Northern sympathizers away. They eventually ended up at Fort Belmont, but they suffered severely, losing many people. Peter Griffith debunks some commonly held views of the cavalry arm of the Army of Northern Virginia. The cavalry had its own manufacturing facility at the arsenal in Clarksville, Virginia. Confederate Cavalry at the start of the war basically used the equipment they had brought with them. Some particularly well supplied units used the McClellan saddle, but most had a hodgepodge of equipment. The Southern cavalry board determined that the “Jennifer” saddle would become standard for Confederate Cavalrymen. Headstalls an bridles were typically the same as those of the Federal cavalry. To save time, Confederate cavalrymen were issued the same jackets and accoutrements as Rebel infantrymen. Order Back Issues of Charge! Burkhard Schulze covers the creation of earthen or sand forts from Styrofoam He includes the creation of templates for the ends so that any fortifications created will be modular. Creating “wooden” floors, painting, and flocking round out the creation of these fortifications. This brief article discusses Civil War skirmishing rules played out on a 4′ x 8′ board. The emphasis is in simplicity and playability. This second brief article shares the same page. It provides readers with the various colors certain parts of the Union City Class gunboats. This class was built by James Eads in 1861, and included the Cairo, Carondelet, Cincinnati, Louisville, Mound City, Pittsburgh, and St. Louis. Webb also includes the typical armament for this ship design. In this modeling article, Doug Kline discusses various ways to work with resin terrain to alter it for your personal use. Topics include sanding areas flat for ease of house placement, creating ruts in roads, creating shell craters, and altering walls. Doug finishes off the article by discussing priming and painting, adding trees, and accenting. Lutheran Theological Seminary: Gettysburg, Pennsylvania Circa 1861-1865 by David Glenn, Jr.
Glenn here discusses the Gettysburg Lutheran Theological Seminary during the Civil War, and he ends the article with a full page template for creating a 15mm model of the Seminary for wargaming and diorama purposes.